Make sure you read through these special maneuvers if you want to go from n00b to awesome. Strafe running is the most important technique to learn, because it allows you to move about 41% faster than normal. This occurs because the game adds the speed you get from moving forwards or backwards, to the speed you get from strafing left or right. More information can be found here. Strafe running is simple: while you're moving forwards (or backwards), strafe left (A) or right (D) at the same time. See the diagram to the right for an example. 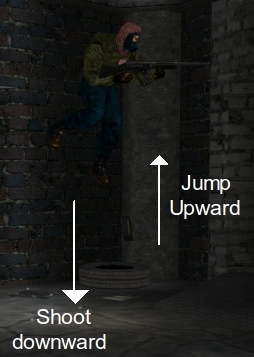 Rifle Jumping allows you to be able to jump higher than normal. You can use this move to jump onto things you just couldn't normally get on top of. Rifle jumping can even be used for surprising an enemy by popping up where they don't expect you to be! This move uses the recoil of the weapon you are using to push you up into the air. The assault rifle is the best weapon to use with rifle jump, because it has the greatest amount of recoil, where the other weapons have far less and won't be able to yield the same results as the assault rifle can. How to rifle jump: after jumping, fire your weapon at the ground while still in mid-air. You should get propelled further upwards and get more air-time than a normal jump would give you. See the diagram to the left. Rifle sprinting is very similar to rifle jumping. It allows you to travel at great speeds by using the rifle's recoil in your hasty escape. It is especially useful in capture-the-flag modes or avoiding shotgun players. The best weapon to use for rifle sprinting is the assault rifle. You will need to be careful that you are shooting away from team mates; it's best to aim toward walls and slightly downward. Your back should be facing the direction you wish to go. Then, walk backwards and jump continuously as you fire your weapon. If you're able to, aim your weapon at the enemy while making this move to get some frags at the same time. You can't see or fire at any opponents that are behind you, leaving you vulnerable. After doing this move, you may have to reload, which could be inconvenient if you are near enemies. You may run into some geometery, such as a wall, which will stop your movement and make you look silly. Grenades have a 2 second timer before they blow up. This can make it difficult to be accurate with them, but it's a necessary evil to ensure you don't blow yourself up in the process. However, you can become more accurate with grenades if you stall them. To do this, select your grenades as the weapon you are using, then press and HOLD the fire button. Hold it for nearly 2 seconds, then let go of the fire button to release the grenade. If you throw it too quickly, the grenade will still have to wait before exploding. If you don't throw it quickly enough the grenade will blow YOU up, resulting in suicide. While stalling the grenade, for those 2 precious seconds you're unable to fire a weapon to protect yourself. You may find your enemies take advantage of this to fire enough bullets into you to frag you before you release the grenade's fury. If you hold your grenade for more than the 2 second fuse, you'll blow yourself up! Grenade jumping is simple, but deadly, so be careful. Because of its deadliness, it's not a very useful move. To grenade jump, you will need some grenades... and a lot of armour to protect you from the blast. Firstly, throw a grenade at the ground and make sure you are close to it. Just before the grenade explodes (grenades have a 2 second timer) jump away from the grenade. You should be able to use the impact from the blast to jump quite high. It's dangerous, and could kill you. If you do survive, your depleted health may be inconvenient if you encounter an enemy. Crouch jumping can be useful to give you just a little bit of extra air-time during your jump, which can be helpful to get up onto ledges, windows, etc. or to jump across larger gaps than can be managed normally. It's quite simple; after you jump, press and hold the crouch key (left shift, by default). Double edge jumping allows to jump farther, higher and faster than during single jumping. To edge jump, you have to strafe-run, jump directly onto an edge and then quickly jump again.